The adventure begins when you arrive at Tromsø Airport, where your photo guides will pick you up and take you to your lodge. You’ll then have some time to rest and get settled, before meeting with the rest of the group. We’ll find somewhere to get some dinner, get to know each other, and discuss the itinerary for the coming days. Make sure to have your cameras ready, as we’ll head out for our very first shoot, if the aurora makes a display this night. Otherwise, we’ll have an early night, so we can get up bright and early to shoot some beautiful sunrise colours in the morning. Over the course of days 2 & 3, we’ll visit some of the most picturesque places Tromsø has to offer, including Oldervik, Kattfjordeidet, Kvaløyvågen, Ringvassøy, and Ersfjord. 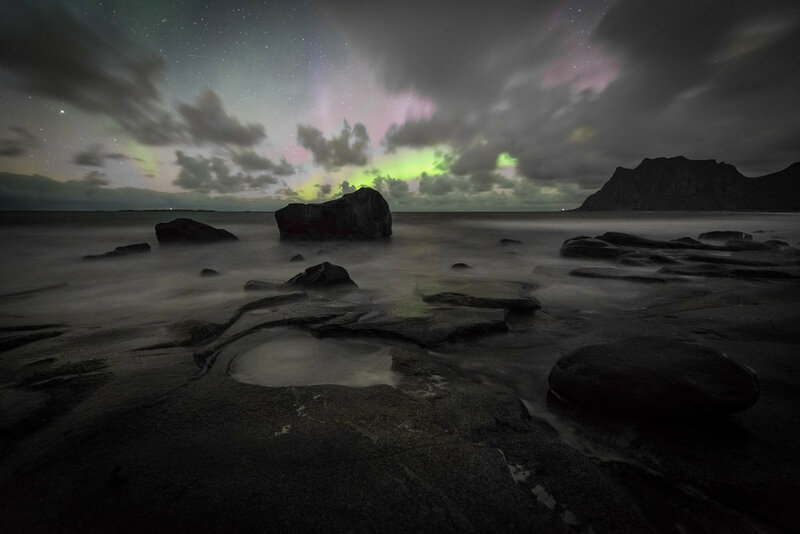 Oldervik is known for its large and interesting rock formations, and is a great place for both sunrise and aurora shoots. It is also a great place to practice your leading lines and rule of thirds. Kattfjordeidet is surrounded by majestic mountains on all sides, which are reflected beautifully in the Katfjordvatnet Lake. Here you can capture some lovely autumn colours and white powdered mountain tops. In Kvaløyvågen you will see traditional Sami tents, and maybe even a few reindeer. The Sami tents, or lávvu, as they’re called in the native language, make a nice foreground for aurora pictures. Ringvassøy is located just a short drive from Kvaløyvågen. Here is another chance to photograph some beautiful mountains, and with the rushing water of the Ringvasselva River in the foreground, this makes for a very picturesque location. On day 4, we get up bright and early, have a hearty breakfast, check our of our lodges, and head on down to Lofoten. 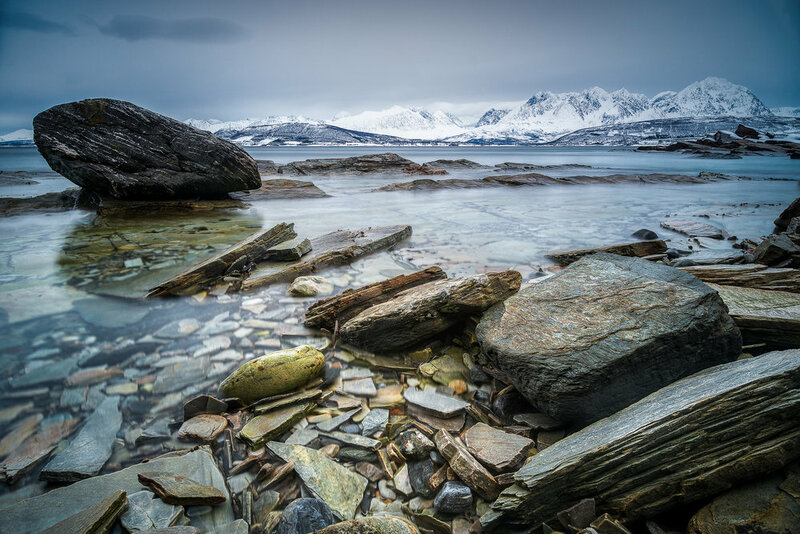 The drive to Lofoten is about 8 hours, so this will give you some time to rest, reflect upon what you’ve learnt during your first few days in Tromsø, and get to know the group even better. We will of course stop for some food along the way, and restroom breaks whenever needed. At our new lodgings in Lofoten, w'e’ll take some time to unpack, and then meet up for dinner. If conditions allow it, we’ll head out for another aurora chase in the surrounding areas, and if not, we’ll take an early night so we can get up bright and early again for the sunrise. Lofoten has many scenic beaches, and over the course of 2 days, we’ll photograph the most well known ones, including Skagsanden, Utakleiv, Haukland, Unstad and Vareid. Nakul Sharma, Traveller and Photographer by profession, born and bought up in Delhi. He grew up infected by the travel bug and spends most of his time in traveling and photography.Working as a Free-lance Tour leader with reputed Travel Agencies In INDIA. He has been Traveling since 2009, Exploring and experiencing the most Beautiful, Cultural and Adventurous places of the World. Jon-Eirik Boholm is an award winning landscape photographer, with over 200 awards, and more than 15 years of photography experience. He is based in Tromso, Norway, and has extensive knowledge about the Tromsø and Lofoten regions, as well as northern lights photography. In November 2013 he completed his studies at the prestigious Queensland College of Art, with a Major in Creative Advertising and a Specialisation in Art Photography. His work has been internationally published. “What is most important to me are the fleeting moments that burn themselves into our memory. My photography is about capturing those essential moments, utilise them in a composition that opens human emotions, and further the viewer's appreciation of the worlds natural beauty”. All participants are responsible for their own camera gear and equipment. We recommend that you bring a digital camera, preferably with a full frame sensor. A crop sensor camera will suffice, but we recommend cameras with full frame sensors as they have better low light performance, which comes in handy when photographing the northern lights. We really recommend that you bring an ultra wide angle lens. This will help you capture the entire beauty of the iconic locations we’ll be visiting during this trip. These kinds of lenses are often the primary choice of landscape photographers, and are also useful for capturing the aurora borealis at night. Make sure that you choose a lens with a wide aperture, such as f/2.8, as lagre aperture lenses let more light onto the image sensor. This is particularly useful when shooting at night. A standard zoom lens is also handy for general purpose photography during your trip. These kinds of lenses help you bring your subject in a little bitt closer, while still keeping some of the surrounding elements in your photo. We recommend wide aperture lenses such as the Nikkor 24-70mm f/2.8G ED or the Canon 24-70mm f/2.8L Mark II, but any standard zoom lens will suffice. A sturdy and dependable tripod is an absolute must in landscape and aurora photography. It is important that your tripod can deal with the rugged outdoor environment, and that it can safely carry the weight of your camera and lens. A flimsy, cheap tripod will simply prevent you from being able to shoot most of the time and the last thing you’ll want is your expensive camera crashing to the ground.